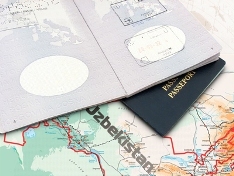 In order to enter Uzbekistan every visitor from every country (except for some CIS countries) must have a valid visa issued by an Uzbekistan Embassy or General Consulate abroad (see address section). Nationals of the countries where Uzbekistan is not represented by any of its Diplomatic or Consulate Missions can apply for Uzbek visa at the nearest Uzbekistan Embassy or General Consulate. Similarly, for their convenience, the nationals of the countries in which Uzbekistan diplomatic representations are available can still obtain Uzbek visa at the Uzbekistan Embassy or General Consulate located in the country other than the country of their citizenship. Our Company will handle visa processing for our clients, both individuals and groups, provided the due documents are presented to us in a timely and conscientious way. Tourist visas can be obtained only upon presenting an Invitation Letter, which our company issues after receiving approval from the Ministry of Foreign Affairs of the Republic of Uzbekistan. Please note that visa issue regulations are simplified for a number of countries as from February 2003. Nationals of these countries receive preferential treatment in terms of visa issue. 3. Our company in its turn issues and provides the tourist with Invitation Letter, featuring the above mentioned telex number. The tourist applies for entry visa presenting this Invitation Letter together with his passport and photos to the Uzbekistan Embassy or General Consulate. It may take from 1 to 3 days to obtain a visa depending on the Uzbekistan Embassy or General Consulate location. .Please note that Embassies and General Consulates reserve the right to charge additional fee for visa registration in addition to the visa cost. According to an Agreement between the Governments of Uzbekistan and the US, the visa fee for US citizens traveling to Uzbekistan is US$ 100 irrespective of the duration in Uzbekistan. According to an Agreement between the Governments of Uzbekistan and Japan, a visa for Japanese citizens is free of charge. The Ministry of Foreign Affairs of Uzbekistan reserves the right to refuse issue of Uzbek visa to an applicant without explaining the reasons.